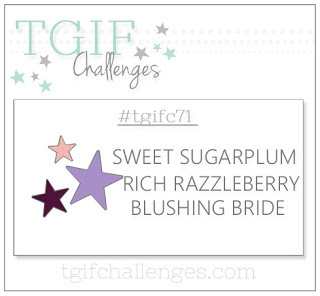 I loved the colors in this week's TGIF Challenge (#TGIFC71) - Sweet Sugarplum, Blushing Bride, and Rich Razzleberry. 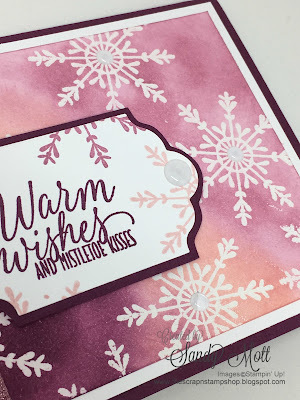 I decided to get out of my comfort zone and do some embossing/inking for the card background. Since I had just received the Tin of Tags stamp set, I used it for this project. I think the snowflake on this stamp set is so pretty! I stamped them with Versamark on a 3 3/4" x 5" piece of Whisper White cardstock and embossed with Clear Emboss Powder. Then I took my daubers and went to work coloring the background. The sentiment is also from this stamp set and I stamped it lightly with the snowflake and cut it out with the Lots of Labels framelits. I then added the Sweet Sugarplum 3/8" glitter ribbon and White Perfect Accents. This card is really super easy to make. The supplies I used are listed below. This color combination is so luscious, don't you agree? While I forgot to take a photo of the inside, I stamped a few snowflakes in the 3 colors and added the sentiment "With Love". Hope you enjoyed today's post. I would love to hear from you! Please e-mail, call, or message me if you wish to attend. Space is limited to 14, so sign up early to save your spot. Or enter your e-mail address on this blog to receive my posts by e-mail. Great use of those colors! Love it! I love the way you've blended these gorgeous TGIF tones into this beautiful background. Thank you so much for playing along with the TGIF challenge this week.